Andrew Cashner notched the Padres’ 28th one-hitter in franchise history Friday night, leading San Diego to a 6-0 win over the Detroit Tigers at Petco Park. The Tigers’ only hit against Cashner came in the sixth inning, when Rajai Davis hit a single to center just past second-baseman Jedd Gyorko. 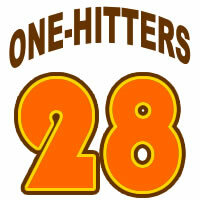 The lone blemish marked the Padres’ 7,176th game without a no-hitter. Cashner struck out 11 on the night and walked two. Cashner secured the one-hitter in the ninth inning by scorching a letter-high 95-mph fastball by a swinging Miguel Cabrera. Cashner also threw the Padres’ 27th one-hitter on Sept. 16, 2013 at PNC Park. His no-no that night broken up by Jose Tabata with a 7th-inning single to right. The Padres beat the Pittsburgh Pirates 2-0.